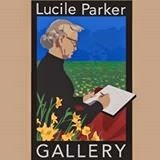 I attended the opening reception of SMAA's show at the Lucile Parker Gallery on the William Carey University campus this evening. The exhibit, featuring watercolor, oil, and acrylic works, will be open through September 18. JoAnn Adams won best Watercolor; Cheryl Beasley won best Oil; Sheri Hoem won best Acrylic, and Kim Whitt won Best in Show. What talented friends I have! I must get out my watercolors and have something to enter next year. 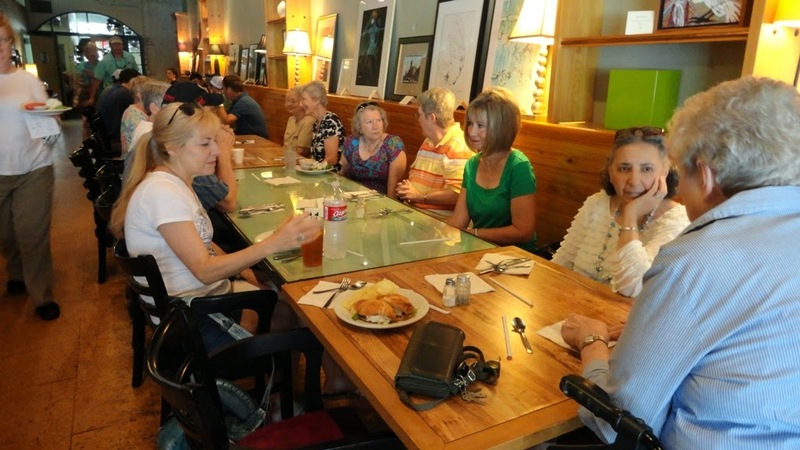 Yesterday I rode with friends to Columbia, MS, to see the Art Colony show and enjoy lunch at Fran Ginn's Back Door Cafe on Main Street. What a treat! My favorite artist, Dana Stratton, is one of the artists featured in the traveling exhibit. The Back Door has an excellent reputation for down-home Mississippi cooking. Fran Ginn is an artist and chef and I am honored to have people get us confused since we share a last name. Her restaurant doubles as an art gallery, with beautiful works always on display. My guild, Pine Belt Quilters, is fast approaching its 15th Biennial Fiber Art & Quilt Show (October 3-4-5). I still have a little quilting to do to finish my entries, but have to do it in short bits until my hand is better. 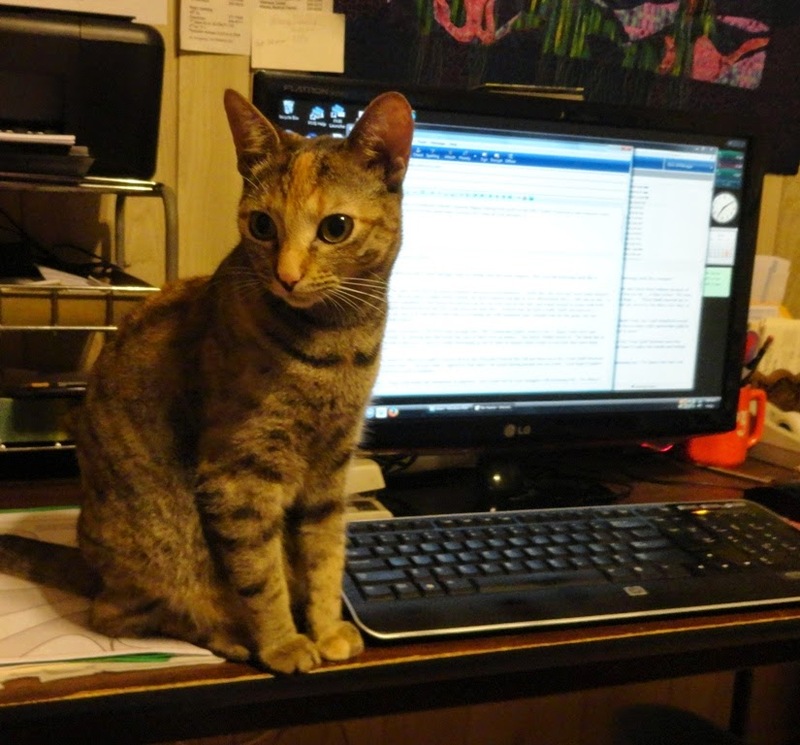 Computer work is somewhat easier than sewing machine work, and Rah-Rah is happy to keep me company. 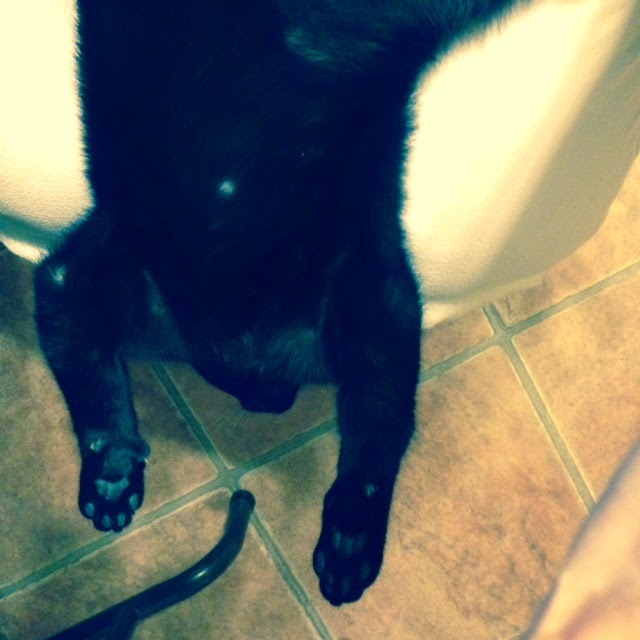 She has grown since her first appearance here appproving of our new website. My SAQA region (LA/MS/AR/AL) had an exhibit called Southern Voices in Little Rock, AR, this spring, and we have another venue for the exhibit--the Gadsden Museum of Art in Gadsden, AL, September 1 thru October 4, 2014. 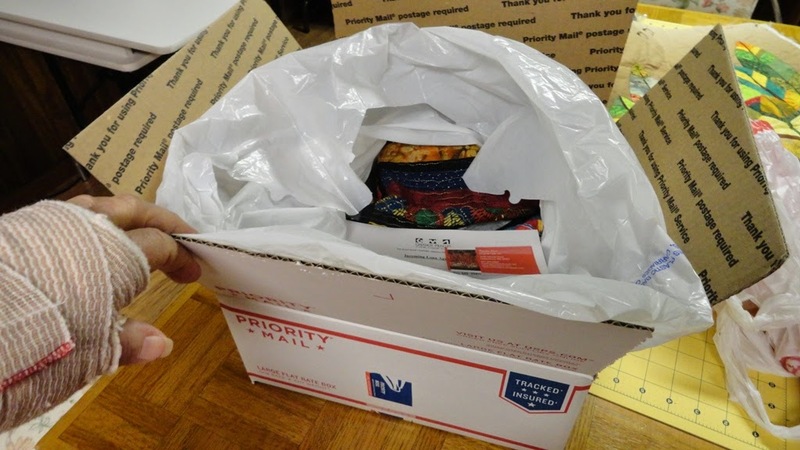 I am packing my piece to send, using a casual-looking folding method which actually eliminates crease lines. I fold any corner, then another corner, then a side and another corner--in other words, anywhere but middle fold lines. I also insert crumpled plastic bags into folds to give a little ease. The folded quilt goes into a large white bag to protect from rain. I also include a copy of the show information and a return address label and postage. I managed this in spite of a wrist brace after carpal tunnel surgery. I read and saw a picture in theJuly 2014 American Quilter magazine where Ted Storm didn't let a broken wrist keep her from finishing her Best of Show quilt "ElaTED." So I decided I'd better stop being such a wimp. Parts wear out and have to be replaced or maintained, and it is necessary though not always convenient to take time out to get work done. I'm going to have carpal tunnel surgery in a couple of days and will be in a splint for a week, so I'm trying to get all my two-handed activities done. Hmmm...nearly everything is a two-handed activity--computer work, sewing, quilting, organizing fabric shelves, driving, taking care of the kitties. 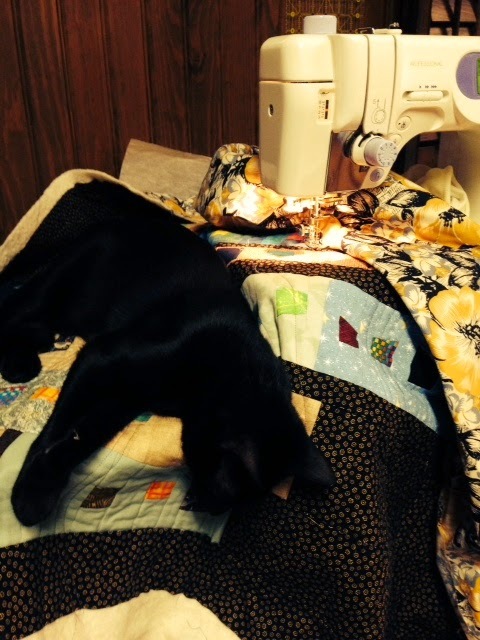 I am trying to finish the quilting on one of my show entries, and doing it with a cat on my lap or, worse yet, on the quilt, really slows the progress. Tarbaby insists on being in my lap when I'm at the computer. His body is longer than my thighs, and he likes to hang his head off between my knees, knowing that I won't let him fall. 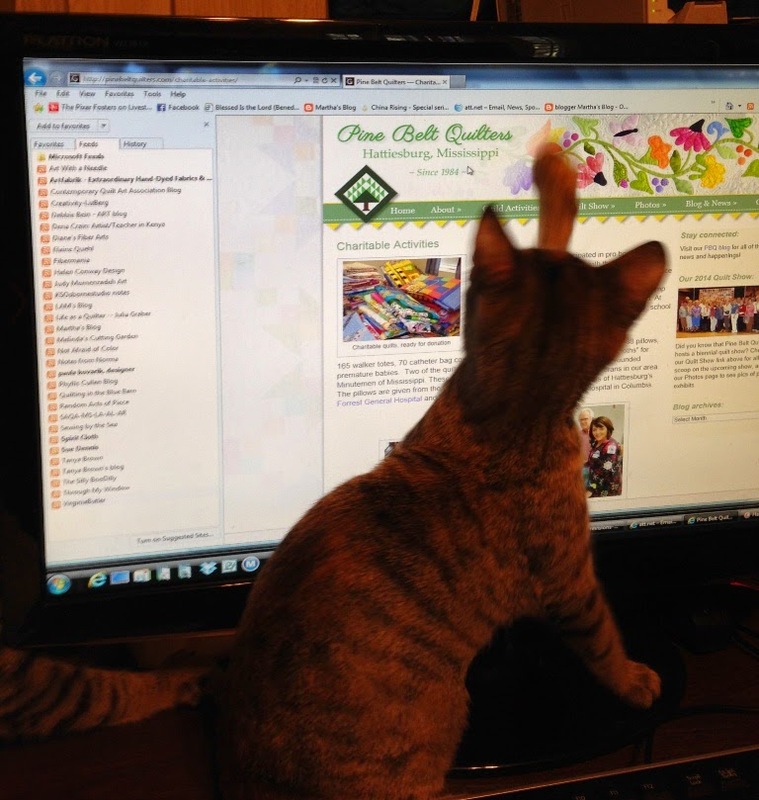 Of course, this takes at least one hand off the keyboard. 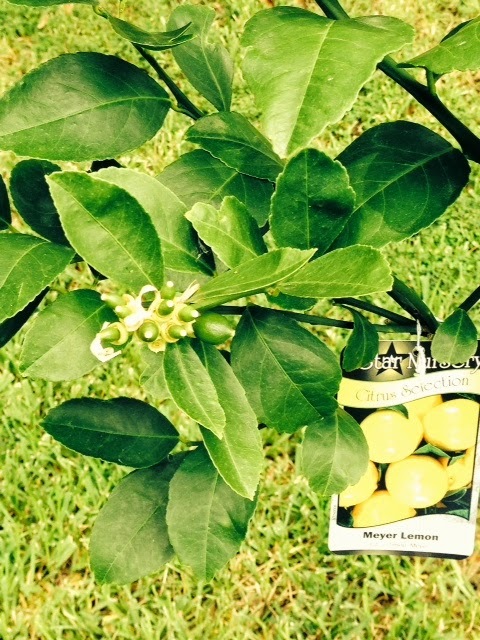 My new Meyer lemon tree has 13 baby lemons on it! Last winter's freeze killed my other tree and this one has only been planted a couple of months--I'm thrilled. As if this were not enough excitement, I finally lost my one remaining baby tooth today. Not surprising, since other original parts are wearing out!